Life Before the Dinosaurs: Diplocaulus. Diplocaulus was an usual genus of boomerang-headed amphibian from the Permian Period. The use for its boomerang-shaped head is a mystery. Maybe it used it to glide through the water like a hydrofoil, or maybe it used it to dig up food, maybe for fighting for a mate, or maybe something else. Very young Diplocaulus did not have the boomerang-shaped head, but older Diplocaulus eventually grew it. Many fossils of Diplocaulus show that a predator must have been eating it, because they were torn apart and have fossilized teeth in them. The teeth belonged to Dimetrodon. It's not obvious how any predator would have been able to eat Diplocaulus without being choked by swallowing its head. But if something could eat it piece by piece, it would be able to avoid swallowing the head. 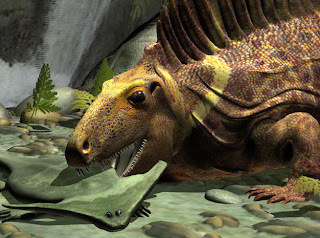 So synapsids like Dimetrodon would not have trouble eating it. Diplocaulus was about three feet long. Its closest relative was Diploceraspis, which also had a boomerang-shaped head and resembled Diplocaulus in many ways. I have come across the idea that it's head was shaped that way to make it difficult to swallow by aquatic predators - big fish or bigger amphibians. It does make sense, though something like Dimetrodon wouldn't be bothered and just rip it up, something large fish or amphibians probably wouldn't be able to do. I started this blog when I was seven years old and I'm in high school now. I retired this blog several years ago, but I still check on it and you can still contact me. Life Before the Dinosaurs t-shirt giveaway! Art started writing this blog at age seven and completed the majority of the work before he turned nine. He did his own research and for a long time dictated the blog entries to me, his mother. I typed exactly what he said and did my best to spell everything correctly. For a glimpse into the early blogging process, check out the video below.